Tonight on AMC THE WALKING DEAD returns with a whole new episode. On tonight’s show called, “Arrow On The Doorpost” Andrea set up a meeting between Rick and The Governor. It looks like it did not really go like Rick thought it would. As Rick and the Governor meet face to face, the governor lets Rick know that he is there for only one reason and it does not look like Rick is pleased with the reason. Did you watch last week’s episode? We did and we recapped it here for you! On last week’s show Rick met up with an old friend of his, Morgan. Michonne, Rick and Carl went for a drive and came to the town where Rick use to be sheriff. Carl was not pleased that Michonne was with them and complained. They went to the town to find guns but found the gun cabinet in the sheriff office was empty. As they walk through the town they saw signs and got attacked by a masked man. After much gun shooting, Carl shot the man. They found out he was wearing body armor, he was only knocked out. When they removed the mast Rick found out it was his old friend Morgan. On tonight’s show in an effort to prevent any more deaths, Rick and the Governor meet to come up with a peace treaty. Tonight’s The Walking Dead Season 3 episode 13 is going to be exciting, and you won’t want to miss it. So be sure to tune in for our live coverage of the new episode of The Walking Dead — tonight at 9PM EST! While you wait for our recap, hit the comments and let us know how know what you thought of TWD’s season 3 episode 12 last week. Check out a sneak peek of The Walking Dead “Arrow on The Doorpost” below! Don’t forget to come back at 9PM. RECAP: Daryl & Rick are armed and Rick enters the Governor’s barn only to find him inside and what looks like, ready to meet with him. The Governor suggests that he is unarmed by putting his hands up in the air and tells Rick, “we have a lot to talk about”. Meanwhile, Hershel is waiting in the car outside the building just in case he, Daryl and Rick have to make a fast getaway. The Governor says that he could have called them all and he didn’t, then he says he is going to remove his weapon and wants Rick to do the same in good faith. The Governor sits down after removing his weapon and surprise, there is a gun just under the table near his hand for quick access. Outside, Andrea has arrived and enters the building, she wants to know what is going on. Andrea tells the two that too many people have died for nothing, she asked Rick to there to resolve things. Rick says he knows about the heads and all the sick things the Governor has done, but he says he just wants to move forward. Milton is outside and he tells Daryl and Hershel to stay put, the two should talk inside alone. 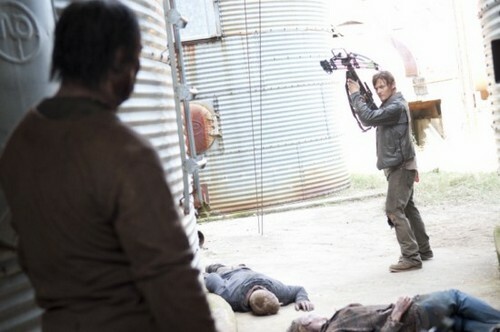 At the prison, Merle and the rest of the group are getting ready for a war – he wants to head on over to Woodbury and storm the place to kill the Governor. Glenn tells him no because they promised Rick, Daryl and Hershel that they would stay put. Andrea is pleading with Rick and the Governor but Rick doesn’t want to join them, he wants to draw boundaries. The Governor tells Rick he is there for one thing and one thing only, Rick’s surrender. Rick and the Governor tell Andrea to leave, they want to talk. Rick and the Governor continue to talk and the Governor brings up Rick’s baby and how she could have been fathered by another man, Rick is not impressed. The Governor gets up, he brought whisky and goes to get it. Outside, Milton tries to explore issues with Daryl and Merle. The group hear a couple of walkers and when the men don’t react, Andrea pulls out a small knife and kills one. Milton and Hershel talk, Milton wants to know more about how Hershel lost his leg and then he asks to see it. Hershel tells him to at least buy him a drink first before he shows him his leg and the two laugh. Back inside the barn, the Governor tells Rick that he can’t let his threat, meaning Rick and his group to remain intact because his people will think him weak. The Governor goes on to tell Rick about a story about when he was at work one day, he got a phone call, his wife had been in an accident and he knew he would never see her again – it was just an accident, it was nobody’s fault. Clearly the Governor is trying to tap into Rick’s emotions over losing Lori, will he do it? Back at the prison, Merle is all loaded up with ammunition and ready to head over and kill the Governor, Glenn tries to stop him and the two get into a fist fight. Maggie jumps in to help and Beth fires a weapon to break it up. Outside, Andrea tells Hershel she doesn’t know what to do, he tells her to come back to them. Inside, the Governor tells Rick he didn’t want any of this, the people chose him because there was nobody else to do the job – he then tells Rick that he knows he got more ammunition and this fight will bring them down to the last man. The Governor then asks Rick to walk away but first, he wants something that Rick has, he takes off his eye cover and tells Rick that he wants Michonne. Then he asks, is one woman worth all the people Rick has at the prison. At the prison, Glenn and Maggie are keeping watch outside when they share an endearing moment and finally make up but Glenn can’t do it in front of the walkers, so they run inside a closed area and make out. The Governor gives Rick an ultimatum, 2 days to give up Michonne or the war is on. Daryl, Hershel and Rick head back to the prison while Andrea and Milton head back to town. The Governor tells Milton that sooner or later Rick has to be taken down, there is no way they can live side by side. Then, the Governor tells Andrea that he and Rick worked out terms which they will finalize in two days. At the prison, Rick tells the group he met with the Governor, sat with him for awhile and said that he wants the prison, he wants them all dead for what they did to Woodbury. Then Rick tells them, “we’re going to war”. Rick goes outside for some air and Hershel joins him, he tells him that the group are taking as well as can be expected. Michonne and Merle think they should hit Woodbury first, while the rest of the group should run. Rick tells Hershel that he has a choice, give up Michonne and it ends everything. Hershel doesn’t think that it is an option, Michonne has earned her place. Rick then asks Hershel if he is willing to sacrifice his daughter’s lives for Michonne because he is hoping Hershel can talk him out of giving her up.